In a bowl add the flour and make a well in centre. Add salt, sugar and milk. 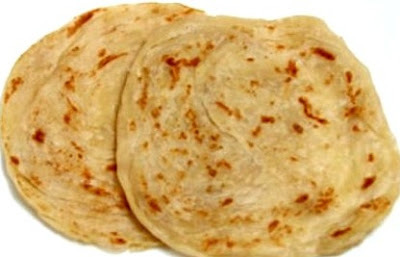 If the dough needs more moisture to make a soft ball, add water and make a soft chapati dough. Add 4 tbsp olive oil and knead well. Now Spray oil on the surface of the dough and close the lid tightly. Let it rest for 3-4 hours. Now divide this soft dough into equal small balls. Place then leaving space with each other on a flat greased surface. Spray oil all over them, spread them smoothly by rubbing with your fingers. Cover them and rest it again for 1 hour. Dust the clean dry flat surface with dry flour. Take a dough ball and roll into thin chapati with a help of rolling pin. Dust the flour in between to roll it thin. Now spray oil on the top of the flattened disc. Now using your fingers gently pull the edges of the disc or chapati. Make sure the chapati does not tear. In between dip yours fingers in oil and start pulling until you see a very thin transparent disc. Now hold in one side and lift it, it will form a thin strip. Rotate in circular motion and place the ends sticking in the middle. Check the picture for the proper shape. Repeat this process with all the remaining balls. Place them on a flat surface. Spray oil all over them. Cover it all and allow to rest for another 1 hour. Now the circles would have puffed up, filled with air. Now heat a tava or pan. Take each circular dough and take a rolling pin and gently roll on the dough. The circular lines should be visible. Do not press and roll. Now place this disc on the hot tava or pan. Once the bottom is fried, flip it and roast on the other side. Do not press them with spatula. Once they are golden brown remove it. Keep this in between your hands and beat them so the circular lines are show up. Now the POROTTA is ready. Serve hot with hot Chalna. In a bowl add all purpose flour, salt, sugar and milk. Mix well. Now add water and knead to a soft dough. Apply oil on the surface and cover it with the lid and allow to rest for 5 mins. Now again knead the dough well and close the lid, rest it for 2 mins. Now divide the dough into small balls, apply oil on top of them. Cover it and rest it for 5 mins. Now roll each ball like puris. Place them one above one applying oil in between each other. Cover them all and rest it for 2 mins. Now take each flattened puri and spread in to a big chapati shape. Cut in into half and roll each pieces into circular shape. Repeat this process with all the puris. Cover all the circles and rest for 5 mins. Roll each circles to a small disc. Place them on the tava and fry both the sides. Repeat this process with all the remaining circles. Once all done, keep them in between your hands and beat them on the sides.